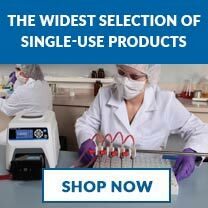 The purpose of this tutorial is to introduce basic concepts of centrifugation, including vocabulary, centrifuge and rotor types, separation techniques, and even gradient selection. For further details regarding centrifugation, please refer to the Sorvall® and Heraeus recommended reading the literature cited in the reference section. Centrifugation is one of the most important and widely applied research techniques in biochemistry, cellular and molecular biology, and in medicine. Current research applications rely on isolation of cells, subcellular organelles, and macromolecules, often in high yields. 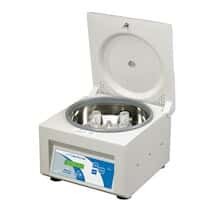 A centrifuge uses centrifugal force (g-force) to isolate suspended particles from their surrounding medium on either a batch or a continuous-flow basis. 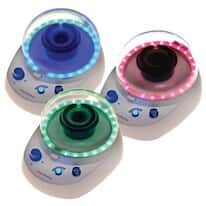 Applications for centrifugation are many and may include sedimentation of cells and viruses, separation of subcellular organelles, and isolation of macromolecules such as DNA, RNA, proteins, or lipids. II. Increasing the effect of gravity: the centrifuge. Many particles or cells in a liquid suspension, given time, will eventually settle at the bottom of a container due to gravity (1 x g). However, the length of time required for such separations is impractical. Other particles, extremely small in size, will not separate at all in solution, unless subjected to high centrifugal force. When a suspension is rotated at a certain speed or revolutions per minute (RPM), centrifugal force causes the particles to move radially away from the axis of rotation. The force on the particles (compared to gravity) is called Relative Centrifugal Force (RCF). For example, an RCF of 500 x g indicates that the centrifugal force applied is 500 times greater than Earth’s gravitational force. Table 1 illustrates common centrifuge classes and their applications. 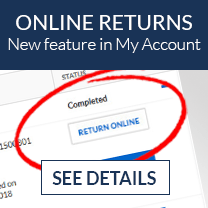 () = can be done but not usually used for this purpose. III. 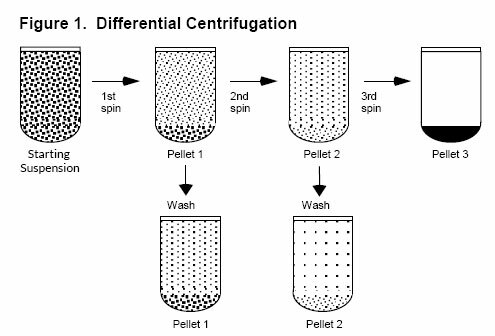 Types of Centrifugal Separations. Separation is achieved primarily based on the size of the particles in differential centrifugation. This type of separation is commonly used in simple pelleting and in obtaining partially-pure preparation of subcellular organelles and macromolecules. For the study of subcellular organelles, tissue or cells are first disrupted to release their internal contents. This crude disrupted cell mixture is referred to as a homogenate. During centrifugation of a cell homogenate, larger particles sediment faster than smaller ones and this provides the basis for obtaining crude organelle fractions by differential centrifugation. A cell homogenate can be centrifuged at a series of progressively higher g-forces and times to generate pellets of partially-purified organelles. When a cell homogenate is centrifuged at 1000 x g for 10 minutes, unbroken cells and heavy nuclei pellet to the bottom of the tube. 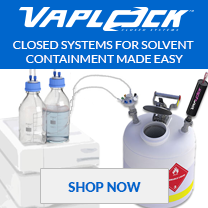 The supernatant can be further centrifuged at 10,000 x g for 20 minutes to pellet subcellular organelles of intermediate velocities such as mitochondria, lysosomes, and microbodies. Some of these sedimenting organelles can obtained in partial purity and are typically contaminated with other particles. Repeated washing of the pellets by resuspending in isotonic solvents and re-pelleting may result in removal of contaminants that are smaller in size (Figure 1). Obtaining partially-purified organelles by differential centrifugation serves as the preliminary step for further purification using other types of centrifugal separation (density gradient separation). Density gradient centrifugation is the preferred method to purify subcellular organelles and macromolecules. Density gradients can be generated by placing layer after layer of gradient media (Table 2) such as sucrose in a tube with the heaviest layer at the bottom and the lightest at the top in either a discontinuous or continuous mode. The cell fraction to be separated is placed on top of the layer and centrifuged. 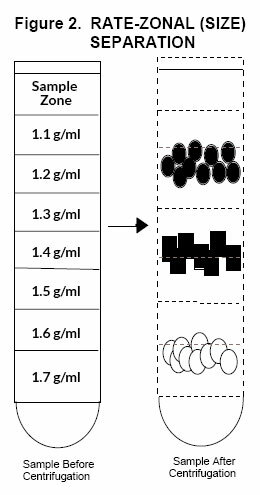 Density gradient separation can be classified into two categories. 2a. Rate-zonal (size) separation. 2b. Isopycnic (density) separation. Rate-zonal separation takes advantage of particle size and mass instead of particle density for sedimentation. Figure 2 illustrates a rate-zonal separation process and the criteria for successful rate-zonal separation. Examples of common applications include separation of cellular organelles such as endosomes or separation of proteins, such as antibodies. For instance, Antibody classes all have very similar densities, but different masses. 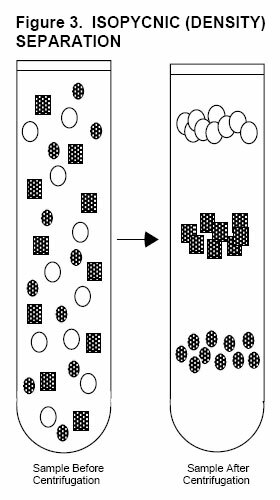 Thus, separation based on mass will separate the different classes, whereas separation based on density will not be able to resolve these antibody classes. Density of the sample solution must be less than that of the lowest density portion of the gradient. Density of the sample particle must be greater than that of the highest density portion of the gradient. The pathlength of the gradient must be sufficient for the separation to occur. Time is important. If you perform too long runs, particles may all pellet at the bottom of the tube. In this type of separation, a particle of a particular density will sink during centrifugation until a position is reached where the density of the surrounding solution is exactly the same as the density of the particle. Once this quasi-equilibrium is reached, the length of centrifugation does not have any influence on the migration of the particle. A common example for this method is separation of nucleic acids in a CsCl gradient. Figure 3 illustrates the isopycnic separation and criteria for successful separation. A variety of gradient media can be used for isopycnic separations and their biological applications are listed in Table 2. Density of the sample particle must fall within the limits of the gradient densities. Any gradient length is acceptable. The run time must be sufficient for the particles to band at their isopycnic point. Excessive run times have no adverse effect. Source: D. Rickwood, T.C. Ford, J. Steensgard (1994) Centrifugation essential data, John Wiley & Sons Ltd. U.K.
Rotors can be broadly classified into three common categories namely swinging-bucket rotors, fixed-angle rotors, and vertical rotors (Figure 4, Table 3). Note that each type of rotor has strengths and limitations depending on the type of separation. Other rotors include continuous flow and elutriation rotors. In swinging bucket rotors, the sample tubes are loaded into individual buckets that hang vertically while the rotor is at rest. When the rotor begins to rotate the buckets swing out to a horizontal position (Figure 4). This rotor is particularly useful when samples are to be resolved in density gradients. The longer pathlength permits better separation of individual particle types from a mixture. However, this rotor is relatively inefficient for pelleting. Also, care must be taken to avoid “point loads” caused by spinning CsCl or other dense gradient materials that can precipitate. In fixed-angle rotors, the sample tubes are held fixed at the angle of the rotor cavity. 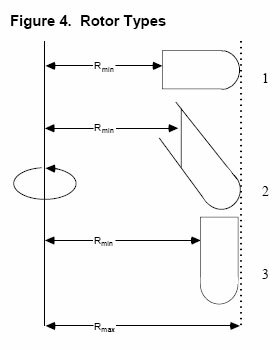 When the rotor begins to rotate, the solution in the tubes reorients (Figure 4). This rotor type is most commonly used for pelleting applications. Examples include pelleting bacteria, yeast, and other mammalian cells. It is also useful for isopycnic separations of macromolecules such as nucleic acids. In vertical rotors, sample tubes are held in vertical position during rotation. This type of rotor is not suitable for pelleting applications but is most efficient for isopycnic (density) separations due to the short pathlength. 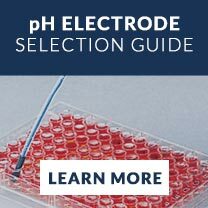 Applications include plasmid DNA, RNA, and lipoprotein isolations. 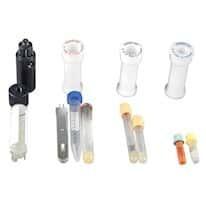 V. Selection of Centrifuge Tubes. Table 4 and Table 5 illustrate properties of centrifuge tubes and the proper rotors in which they should be used. 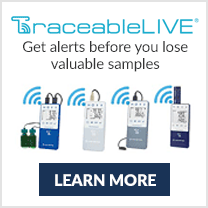 *For more information, please check our chemical resistance chart available on this site. 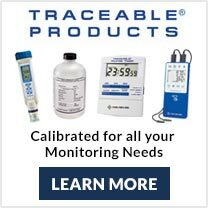 check product guide pages or tube packaging for notes on recommended sample volume and maximum speed. 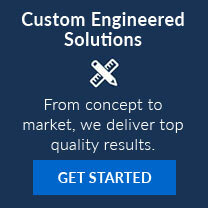 always run thin-walled, sealed tubes full in a fixed angle or vertical rotor. autoclave tubes only if absolutely necessary and only at 121°C for 15 min. avoid cleaning plastic tubes in automated dishwashers or glassware washers, which may produce excessively hot temperatures. we recommend that you clean tubes with a mild laboratory detergent in warm water, rinse, and thin air dry. tube must be carefully matched with rotor type to prevent sample loss and/or failure as illustrated in Table 5 below. VI. Common Centrifugation Vocabulary and Formulas. Pellet: hard-packed concentration of particles in a tube or rotor after centrifugation. Supernatant: The clarified liquid above the pellet. Adapter: A device used to fit smaller tubes or centrifugal devices in the rotor cavities. RPM: Revolutions Per Minute (Speed). Rmax: Maximum radius from the axis of rotation in centimeters. Rmin: Minimum radius from the axis of rotation in centimeters. K-factor: Pelleting efficiency of a rotor. Smaller the K-factor, better the pelleting efficiency. S-value: the sedimentation coefficient is a number that gives information about the molecular weight and shape of the particle. S-value is expressed in Svedberg units. The larger the S-value, the faster the particle separates. For more information about sedimentation coefficients, please refer to the section on references and suggested readings in this article. Pelleting time: time taken to pellet a given particle. T = K/S where T= pellet time in hours. K = K-factor of the rotor, and S = sedimentation coefficient. Centrifugation : A Practical Approach, by David Rickwood, (Editor) (1992) ASIN: 090414755X. Disclaimer: Cole-Parmer products are not approved or intended for, and should not be used for medical, clinical, surgical or other patient-oriented applications.